James Macardell (1727 or 1728-1765), Mezzotint engraver. Sitter in 3 portraits, Artist associated with 291 portraits. Reynolds shows his engraver, James Macardell, in the act of engraving a copper plate. 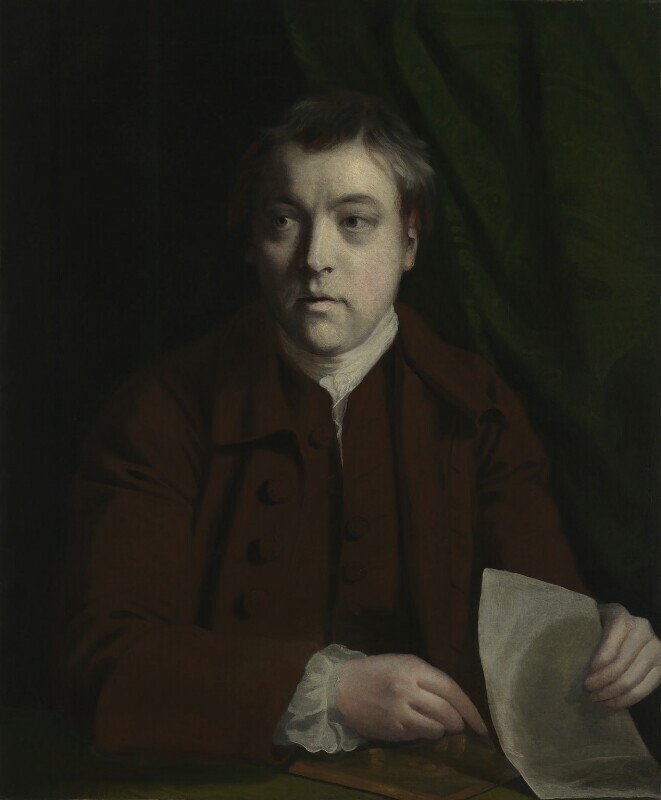 More detailed information on this portrait is available in a National Portrait Gallery collection catalogue, John Kerslake's Early Georgian Portraits (1977, out of print). Government falls after criticism of its handling of the Seven Years War. Prime Minister Thomas Pelham-Holles, 1st Duke of Newcastle is succeeded by William Cavendish, 4th Duke of Devonshire, who forms a ministry effectively run by William Pitt the Elder. Satiristist Thomas Rowlandson is born in Old Jewry in the City of London. His main rival James Gillray is born exactly a month later in Chelsea. Completion of William Edwards' Old Bridge, Pontypridd; the longest single span bridge in Britain for the next forty years. 'Black Hole of Calcutta': a group of British prisoners, including East India Company servant John Zephaniah Holwell, are locked in a small, overcrowded dungeon overnight when Fort William in Calcutta is captured by troops of the Nawab of Bengal. Holwell claims 123 of the 146 prisoners died. Outbreak of the Seven Years War in which Britain, Hanover, Prussia and Denmark are pitted against France, Austria, Russia and Sweden.